If you have ever switched from an iPhone to an Android or Windows phone, either temporarily, out of necessity, or for testing purposes, you may have noticed that a new phone will sometimes not receive inbound messages that have been sent from other iPhone users. Well, you probably didn’t notice it because you didn’t get any of the messages, but someone probably told you that they sent you a text and you never received it. These disappeared messages are almost always due to a quirk of iMessage, which seems to strongly couple itself to a phone number that belongs to an iPhone, and if not disabled or deregistered, that iMessage attachment can end up hoarding the messages in some sort of ethereal messaging purgatory, which then prevents them from being delivered to the new non-Apple phone. Fear not though, because you can get a phone number out of iMessage Purgatory by using one of two different methods outlined below. If you ever plan on switching from an iPhone to another phone, even if for a temporary period of time, this should be high on your to-do list, right along with exporting contacts into a compatible format and saving other personal details. If you don’t deactivate iMessage from the phone number this way, you may lose some inbound text messages on the new phone that have been sent from other iMessage users. 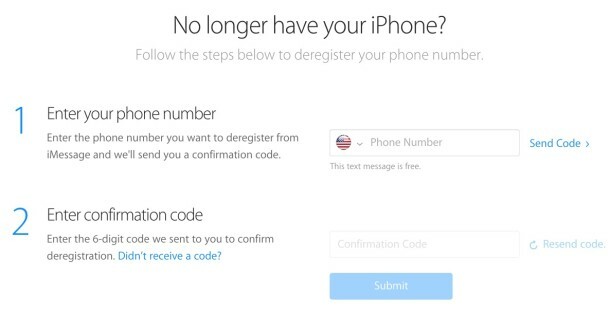 We’ll walk through the two methods that are available to deregister iMessage and deactivate it from an iPhone and associated phone number, thereby detaching iMessage from the number. Perhaps the easiest way to handle this is to simply turn off iMessage on the iPhone while it’s still active, before switching out SIM cards or switching service through a CDMA provider. This can be done in Settings on the phone, and disabling iMessage can be done in a few seconds. Of course, if you no longer have the iPhone, or maybe it took an extended bath and is no longer functioning, this is not an option, which means you’ll have to go another route. If you are no longer able to manually disable iMessage on the iPhone for whatever reason, the next option is to use the official de-registration service offered from Apple. You’ll need to have the new phone handy to complete this process, because it sends the phone number a text message confirmation code to complete the deactivation. That should be the end of it, though from experience it seems to take a little while for the effect to carry over and for the phone to receive messages from iPhone and iMessage users again as it should. This is a fairly common experience with people who have switched to an Android or left an iPhone for one reason or another. I had a friend that experienced this recently after having to switch to Android for work, and they went through several months of receiving no text messages at all from iPhone users, all disappearing into the great iMessage void and never arriving on their Nexus. 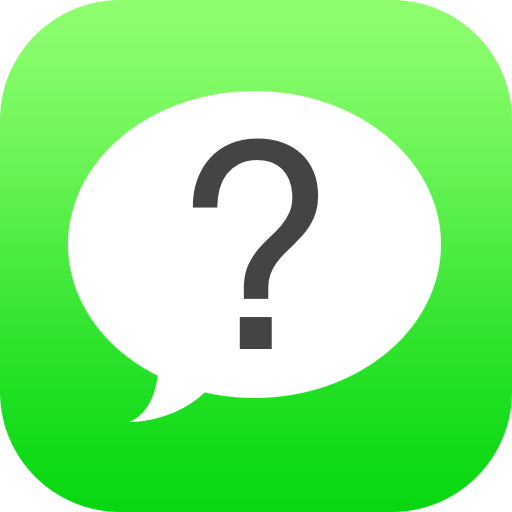 Simply disabling iMessage or deactivating iMessage for the given phone number is an easy solution and should prevent this from happening at all. By the way, if you do plan on juggling the same phone number between several mobile platforms, using something like Google Sync for your Contacts and Gmail is highly recommended, because it makes keeping this data consistent between an Android and iPhone quite easy, whether going both ways or just one way. Don’t forget to erase the personal data from your prior phone too by resetting it, whether it’s Android or iPhone, even if the switch is temporary or with a loaner device. Yea this isn’t just relevant to people who are intentionally “leaving” iPhone. Here’s a very practical scenario that has played out with many people I know: they lose or damage their iPhone but are still in contract so a new iPhone will cost something like $500 to buy and renew contract, or $750+ to buy outside of contract, yikes! That’s like half your mortgage payment, just to have a phone again? So what they do instead is buy a used Android on Craigslist or borrow an Android phone for a while, which are much cheaper (or buy new, even a brand new Nexus 5 is really quite nice for $350 unlocked!) and use that as a temporary phone until they can renew their iPhone contract for a subsidized price again. I know many people who have casually ‘switched’ from an iPhone for a few months or longer for those scenarios, rather than eating the cost of an off contract iPhone they just use another thing for a while, it still makes calls, emails, and does texts, Facebook, etc, so it works for that interim period. Then they get the iPhone 6S Plus or iPhone 7 or whatever is the latest and greatest for $199 subsidized price again. I would probably do the same thing myself, though sometimes you can get lucky and find a cheap iPhone on Craigslist too, but even the older models on Ebay / Craigslist are often 2-4x the price of a used Android, the iPhone holds resale value really quite well. For what it’s worth I would say do BOTH, disable iMessage, then deregister the number. Not getting texts from people is incredibly frustrating, and there is literally no indication you are not getting them except for some irate spouse, friend, or colleague wondering why you’re blowing them off. Not a cool thing to experience! You can do both of these things, and *still* may not get receive messages from iPhone users. Apple’s follow-up support to this problem is a mess (“tell all your contacts to delete your contact card and start over” or “tell all your contacts to delete an existing conversation and start over.” Good luck with that. Also, group conversations are broken and will constantly revert to iMessage when they should fall back to MMS once one of the recipients deactivates iMessage. For whatever reason, iOS doesn’t “check” or “see” that all of the group members are no longer valid iMessage recipients, and still sends iMessages rather than group MMS. There’s a complicating bug where iMessage will ‘autocomplete’ a group (even if you’ve deleted the existing thread) as iMessage. Once again, this breaks what should be/finally reverted to MMS. it’s been 30+ days, I followed both de-activation steps, have had most of my contacts take these ridiculous steps (good luck explaining these steps to less tech-saavy contacts), made multiple calls to AppleCare, and STILL have messages disappearing into the ether. This is incredibly frustrating, and I hope Apple gets nailed with that suit in California. Honestly, what was Apple thinking? I am just a little colorblind. I cannot easily tell the difference between green and blue bubbles. I never knew about iMessage until I read about iMessage in the press. I travel a lot. Who knows how many messages I have missed! I opted out, and turned off iMessage on all my devices. I also deleted it from my MacBook.